In July, Jay had a wonderful opportunity to work in Peru. It just so happened that the scheduled travel time spanned the week of our 25th wedding anniversary. We had been planning a return visit to Venice to mark our anniversary, but this seemed like an opportunity for a new adventure, so we changed our plans. We postponed celebrating (by 4 days), he added a few days at the end of his scheduled trip, and I flew to join him in Lima for an anniversary adventure in Peru. Jay was in Peru for about three weeks before I arrived. We spent a lot of time on Skype, emailing, etc. getting things scheduled. Finally, it was time to fly to Peru. My plane was delayed, so I actually arrived in the wee hours of Thursday morning. Even in the darkness of night, I could tell Peru was as beautiful and biodiverse as I had read about and I could not wait to see it in the light of day. After a little sleep, I enjoyed hanging around the hotel while Jay worked. We stayed at the San Antonio Abad Hotel in the Miraflores District of Lima. The Hotel served as our "base camp" for the next couple of weeks. I can not say enough about the Hotel, but more importantly, how great the entire staff is. They were very accommodating to our requests and storing luggage for us as we took trips away from Lima. Friday morning arrived and we were off on the first part of our travels. 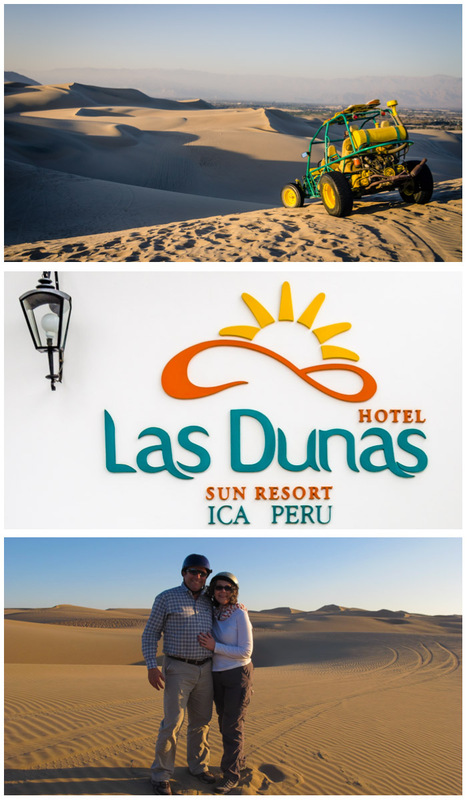 We rode a bus about four hours south of Lima where we stayed at Las Dunas Resort in Ica. Las Dunas is a beautiful and relaxing oasis in the desert. We checked into our room at 3:00 p.m. and where scheduled for a dune buggy ride at 4:45 p.m. It was sunset, so the light was beautiful and we were the only ones out on the dunes. Our driver even stopped and waxed up the boards for us to sand surf down a dune before he took us back to the Resort. I have not laughed that much in a long time. Jay made the comment that he hopes we are taking dune buggy rides for our 50th anniversary. Me too! Twenty-five years have provided a lot of moment where we feel like we have dropped off the edge of a sand dune, but somehow, we always seem to hit the bottom laughing. It has been the best ride of my life - literally and figuratively. And, while the dune buggy ride was crazy-fun, I'm still holding him to his promise of a gondola ride in Venice. Okay, so I promise, no more anniversary stuff. Next week we are flying over the Nasca Lines. I hope you will come back, because I think it is fascinating and I really want to share it with you.